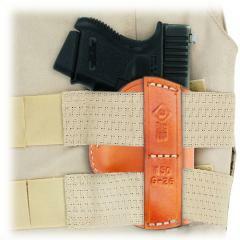 The 150 Hide Out Vest Holster from Aker is a discreet design intended to be worn with body armor or a tactical vest. Its twin slots fit a pair of straps measuring up to 2 inches each wide, allowing it to sit like a vertical shoulder holster for maximum portability and accessibility. Its open top design provides rapid access to your weapon, minimizing your reaction time in fast-moving tactical situations. It is made from premium cowhide leather, oiled and finished for an attractive tan color. Left and right draw side options are available to suit any shooter and any tactical loadout. Great product. This is to replace one that lasted daily use for 24 years. Aker makes a durable product. Been wearing it for two work weeks straight I love the fit and finish.